The tears were absolutely pouring as I read this. Tears of compassion, sadness, fury. His GP surgery ‘couldn’t condone it’? I obviously wouldn’t wish cancer or terminal illness on anyone, but I do wonder how quickly they would have changed their minds if they had experienced his situation for just five minutes. I am so sorry that your dad did not receive the support, respect, and autonomy he received. Your support must have meant the absolute world to him, and I am so glad that he had family who loved him enough to go through every step of the fight with him, and be with him at the end. I couldn’t respect you more for sharing your story and educating people on exactly how the process works. Even as a huge supporter of dignity in dying, there were things I was unaware of. It’s a brilliant tribute, and I really hope that your writing can at least persuade people to think deeper if they are in any way against the movement. Thank you so much for your kind words. It’s heartbreaking that my Dad’s case isn’t an uncommon one. There are people across the country and the world who would benefit from a change in the law and it’s wrong that by wanting control they’re viewed upon as criminals. Thank you so, so much for writing this incredibly moving and powerful post. I’m crying as I write this because it’s just so unfair, and I am so frustrated by it. Your father’s story broke my heart, honestly. The way he, and so many others, have been treated is just cruelty under the guise of ‘compassion’, but the only people it’s protecting are medical professionals and their careers. There is no humanity in it. My nan suffered from Alzheimer’s Disease, and she was in a very bad way by the time she died. For years, she’d been unable to comprehend anything, and unable to speak. It makes me angry that she was just kept in a room to waste away, something she would never have wanted. My poor grandad had to watch the woman he loved become a shell. It’s just horrific. I truly hope that one day soon we will have the ability to make these decisions for ourselves. We need to do better for people who are at the end of their lives. Thank you sweetheart. That means a lot. The law around Alzheimer’s patients is a lot more complex. 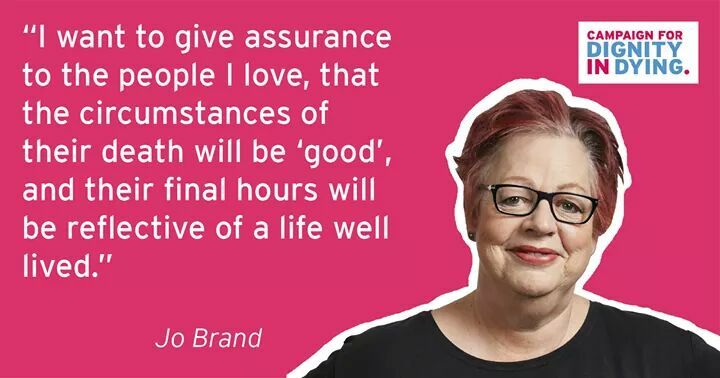 By the time they’re too poorly to benefit from assisted dying, they’re too poorly to request it either. Sadly my Dad’s wife, having gone through all that with my Dad, is now watching her own Dad deteriorate with Alzheimer’s and Parkinson’s disease. He’s so far from the man he was, or would want to be, but too far mentally removed from responsibility to be able to make any decision around his future. Sadly he’ll just deteriorate slowly until the end. Thank you again for reading our story. I hope we’ll make legal progress in 2018. That was exactly the same story for my beloved parents and probably thousands of others. Care homes, even where they do their absolute best, cannot halt, the terrible to witness, deterioration of our loved ones.. Mum had Alzeihmers and a poor heart and eventually died in the care home where dad also chose to live with her, as he could not bear to be apart, despite her no longer recognising him as the love of her life for almost 63 years. He died the day she did inside, but his strong heart kept him going for another almost 7 years despite his own illness of Prostate Cancer and Parkinsons. He had moments of pleasure Im sure but his life became a huge burden to him without the love of his life and his own illnesses. For the last 18months or more, he could not speak, became bedridden, had long been doubly incontinent, did not recognise his family and could not even turn over in bed ,feed himself or even scratch his nose if it itched. No quality of life, really just a living death. In the end he could not swallow and effectively choked and drowned in his own secretions. The last days of his life the District Nurse refused to give him morphine to ease his distress because she didn’t think he was agitated enough. My God I wish I had been able to be there to advocate for him. My sister was too close and had been bearing the brunt of witnessing his deterioration for too long. I live in Australia and so was spared the physical witness of the worst of it. Dad had always been an independent man, looking after everyone. He did not know what was happening to him but I know he would have taken his own life if he could. Surely he deserved a kinder end, a more compassionate end to his life. 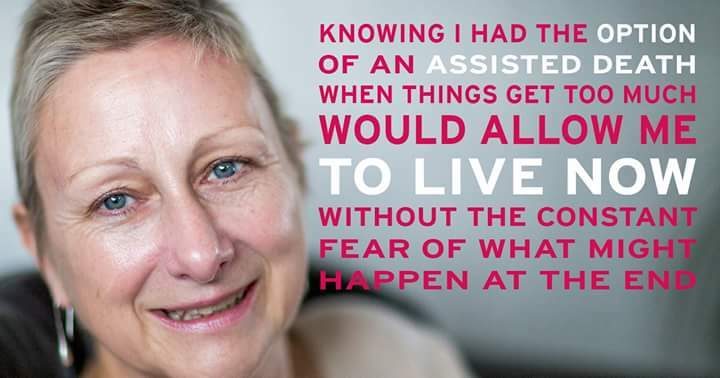 It is not just those who have cancer or other diseases who suffer, many, like my mum and dad, are not in a fit state to ask for a release by the time they really need to. 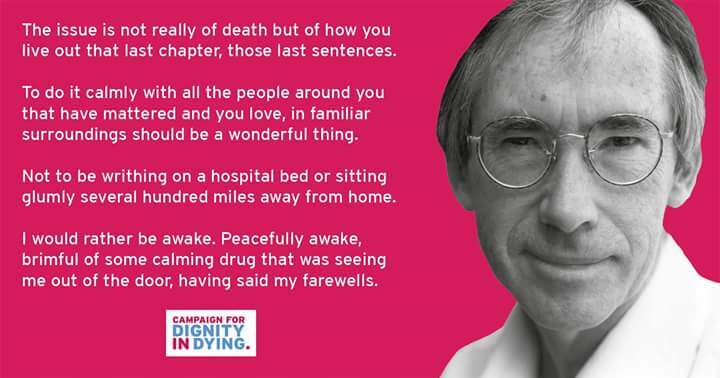 We must make sure that people like them can have the right to an assisted death too. This problem is only going to get worse as the ageing generation of Baby Boomers have increasingly failing health and disease. Let’s give people the right to choose when it is their time to go if that is what they want and need. 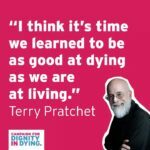 Having the right to die with dignity will give us the right to live without fear, free of unendurable suffering and mental anguish until you no longer can. I’m so sorry to hear what you went through, and indeed your parents too. I think you’re right about extending assisted dying to people who physically cannot ask for it themselves; we generally know our own family and know whether or not they would want what is merely an existence. Of course this may be open to being taken advantage of by unscrupulous family members, so would need to be much more stringently controlled by law. 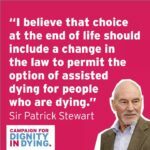 If we can get the law changed to allow assisted dying in terminally ill patients first, then hopefully more legislation may follow in the future. I absolutely agree with everything you have said Jo. A vet would say it’s not fair to let an animal suffer and it would be best to let it go peacefully, so why can’t we be allowed to do the same!!! It’s unbelievable the difference between how we treat animals and how humans are treated.